This is one of my favorite mushrooms. Maybe because you can find it so early in the year. It's Flammulina velutipes, the Winter Mushroom, or the Velvet Foot or Velvet Stem Mushroom. This picture shows the black, velvety base of the stem. It's an edible mushroom, but with caution. It resembles the deadly poisonous Galerina marginata. 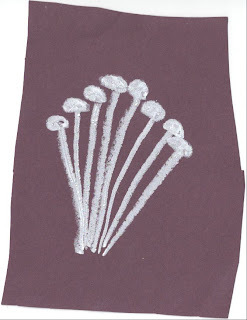 To be certain of your identification, you need to make a spore print. Flammulina velutipes has a white spore print. I've tried it (after a spore print of every cap) and it was pretty good. I'd describe the flavor and texture, but it was at least five years ago that I ate it, and I don't remember much other than that it was "pretty good". But I always enjoy finding it. There's a cultivated form called the Enoki mushroom. It looks nothing like the wild form. You can find it the grocery store.